To be honest, back home, we are huge fans of Vietnamese cuisine. And to say the least, Vietnam didn’t disappoint us. For one month, we traveled through Vietnam. 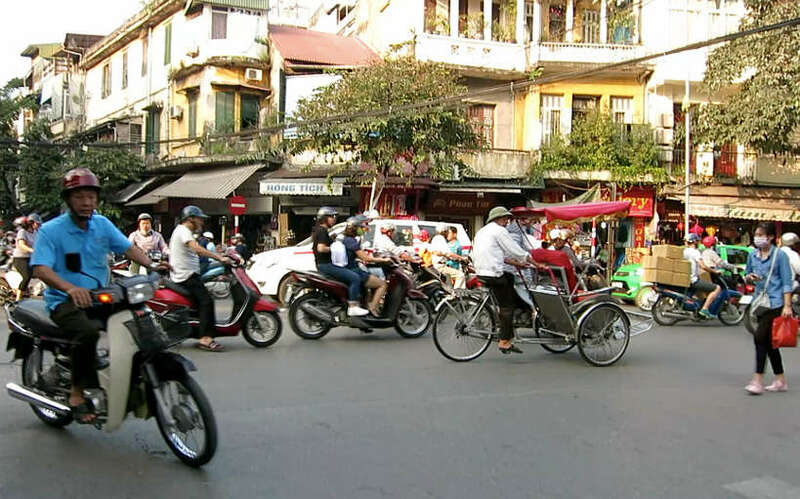 Starting in Hanoi, the capital in the North all the way to Ho Chi Minh City, the economic powerhouse in the South. From the recent visit by President Obama in May 2016 to the significant growth of tourism in Vietnam, we really felt a sense of renewal in the country. 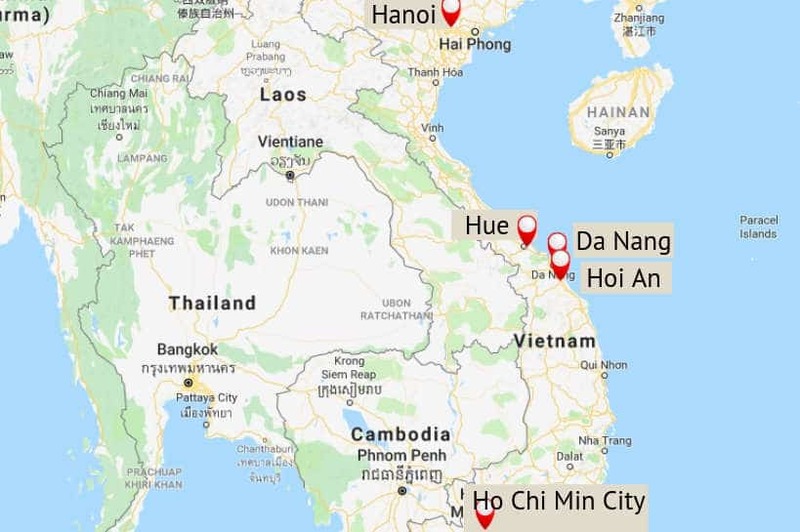 All of this contrasted by the attachment and fascination to the past with Ho Chi Minh statues and references to “Uncle Ho” throughout the country. Another distinctive characteristic of Vietnam is the sheer number of motorcycles and their overwhelming presence everywhere! When it comes to the food in Vietnam, the Vietnamese are proud of their cuisine and they make sure that you get to taste the best of it. 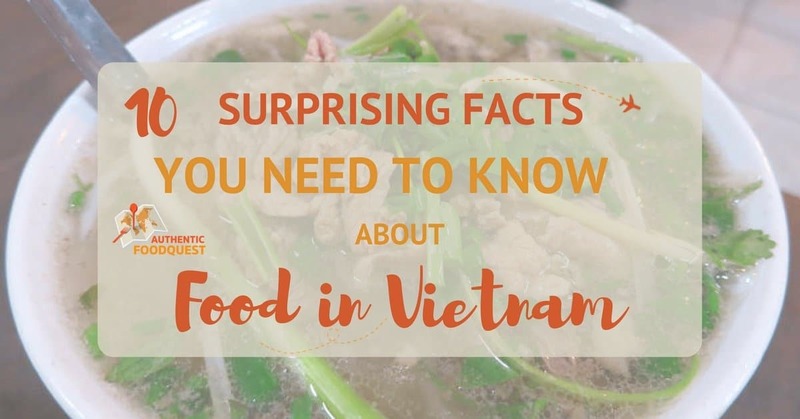 So let’s dive into our surprising facts on the food in Vietnam and what to expect on your trip to Vietnam. The cuisine in Vietnam is influenced by the geography of the country. While the majority of the country is hilly and mountainous, there is a long coast along the South China Sea, that provides fish and other seafood that are staples in Vietnamese cuisine. The two main symbols of Vietnamese cuisine are rice and a very specific fish sauce to Vietnam called nuoc mam. Food in Vietnam varies and is divided into three distinct regions, the North, Central, and the South. 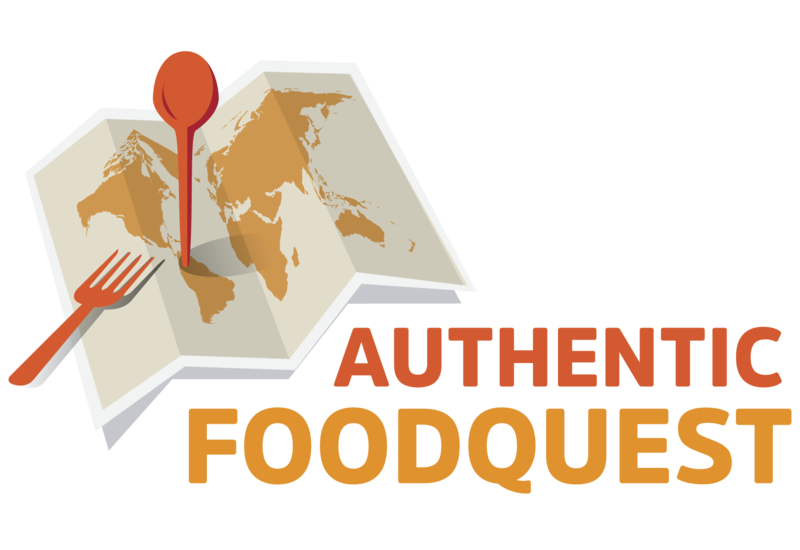 Our culinary journey took us to each of the regions to explore the distinctive flavors. In the north, we visited Hanoi. 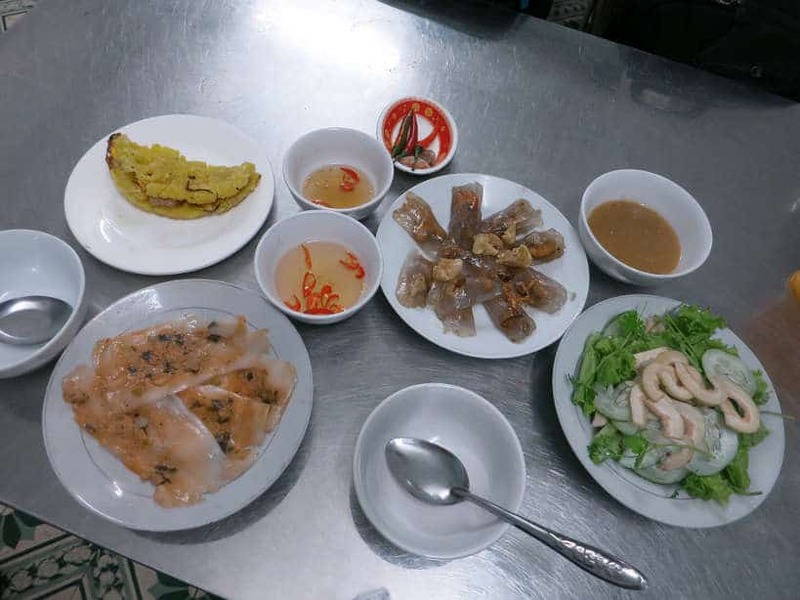 In the central region, we spent time in DaNang, Hoi An, where we took a cooking class and Huế. And finally, Ho Chi Minh City (commonly known as Saigon) in the south. As we traversed through the country, we noted regional differences. 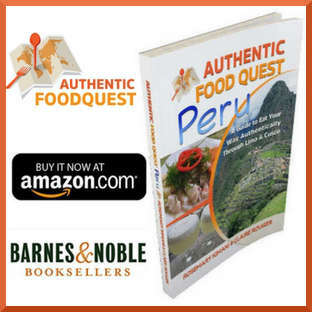 The north is mountainous and cooler and soups play a large role in the cuisine. The famous Vietnamese pho soup is an example of a northern dish. The cuisine in the central region is distinct and made up of several small dishes. Huế was once the Imperial Capital of the country and many delicate and creative dishes dedicated to the Kings were invented here. This was our favorite region for the local food in Vietnam. The cuisine in the southern region is influenced by Thai cuisine and is spicier than food from the rest of the country. Coconut based curries served with noodles and rice as well as a wide range of tropical fruits and vegetables are abundant. One observation you will make immediately is how fresh and flavorful the food is. 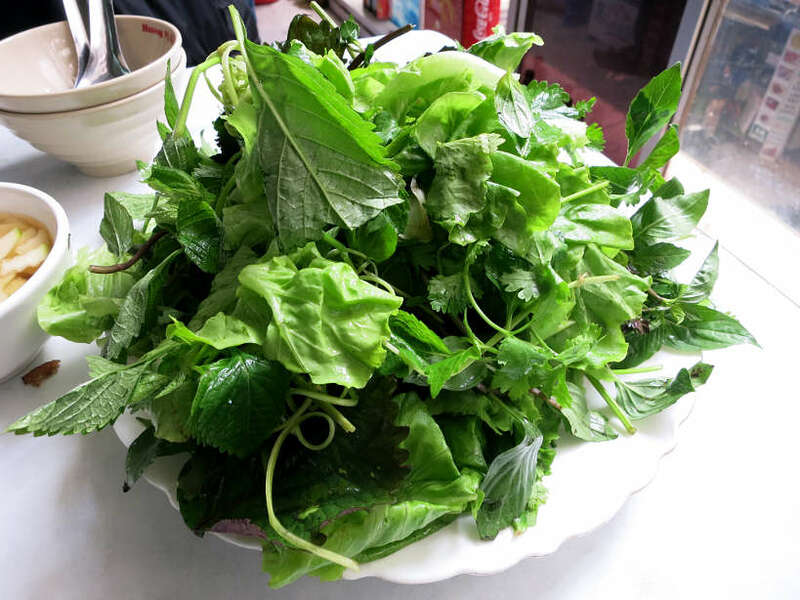 The Vietnamese use mounds of herbs in their dishes, which make for very fresh and delicious meals. As soon as we arrived in Vietnam from Bangkok, Thailand, we could immediately taste the difference in the food. The herbs used are diverse and plentiful and accompany practically all meals. Raw herbs are served in a huge bowl and they are chopped, tossed, rolled and wrapped into dishes. From soups, rice, sandwiches, rolls and noodles, the fresh and simple herbs bring forth the delicious flavors of the foods. The typical restaurant culture in Vietnam is not what you might typically expect coming from the U.S. or Europe. Yes, you will find restaurants with waiters, normal sized chairs, and air conditioned places, but this is not where you want to eat. The cheapest and the most delicious places to eat are on the city sidewalks in a casual environment. Look for the small plastic stools and join the crowd of locals slurping down delicious bowls of soup. 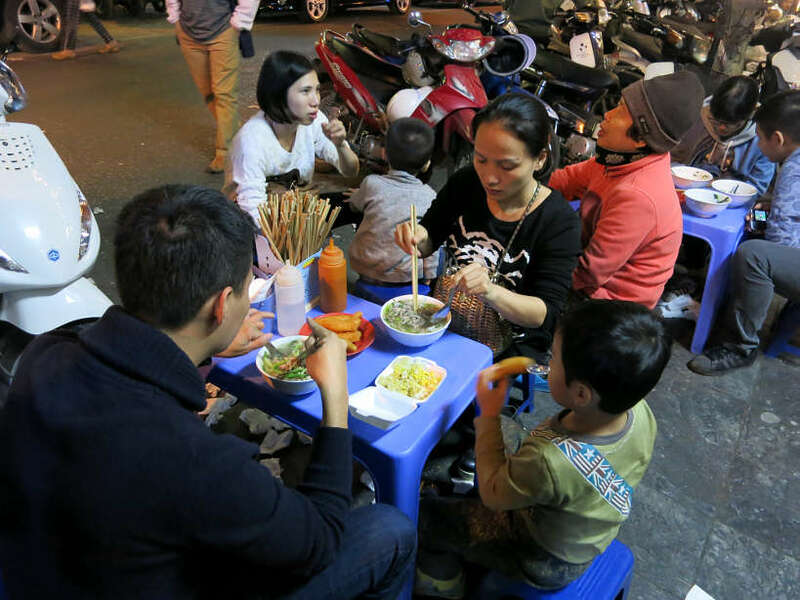 In Vietnam, people eat very close to the floor, about 30 inches from the ground. And, if you look closer, you will even see local women sitting on even smaller stools, about half the size (about 15 inches) when washing dishes. If you are afraid of getting sick, check our article on How To Eat Safely On The Street for more tips and practical advice. When locals want to eat a particular dish, they usually go to a specific street vendor, that specializes in that dish. In Hanoi’s Old Quarter, for example, there are particular streets that are named after specialties or crafts. For instance Hang Mam – street of fish sauces and Hang Thiec – street of tinsmiths and tin shops. Often times, the best way to tackle the food in a city is to think of it as a progressive buffet. For dinner, for example, start with the vendor who specializes in spring rolls. Then move to the lady who grills nem lui (pork on lemongrass sticks) on the sidewalk. Then enjoy the best pho soup in town or traditional Vietnamese bánh mì sandwich and finally end your day with chè or Vietnamese traditional desserts from the renown vendors in town. 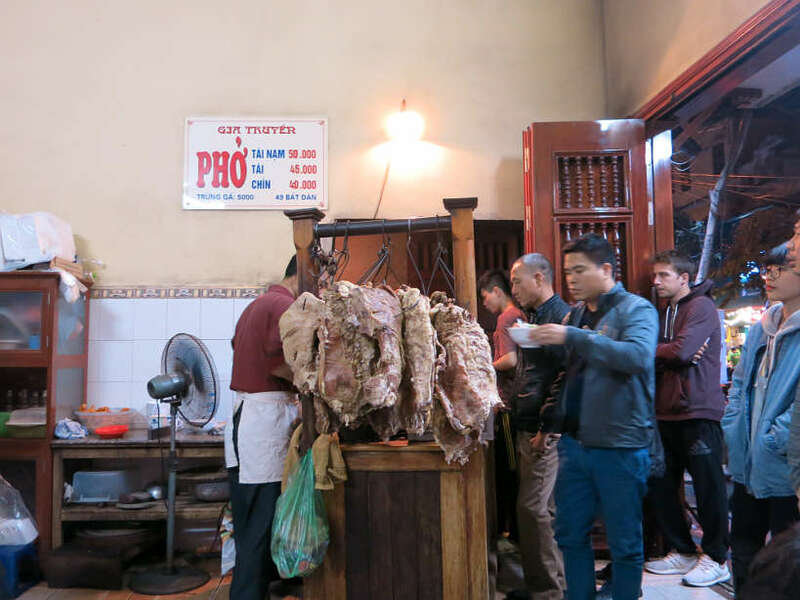 One dish only for our favorite pho restaurant in Hanoi; don't mind the meat at the cashier! There is no doubt that the food in Vietnam will surprise and you will want to taste the many dishes and specialties available. In the same way, you will not want to miss the Chè. Chè are the most popular Vietnamese desserts. In Vietnam, it refers to any traditional sweet beverage, dessert soup or pudding. You will find many different kinds of chè, served either hot or cold. When eating in Vietnam don’t expect to find an extensive list of drinks to choose from. 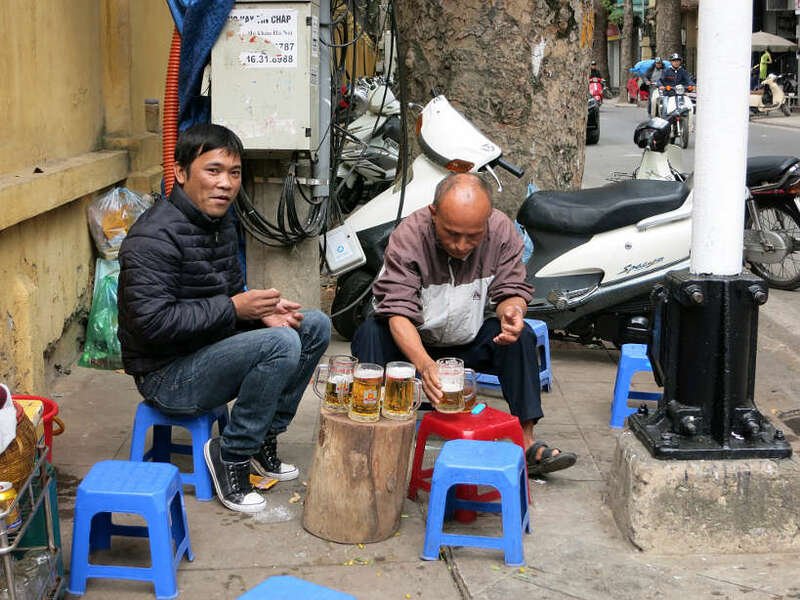 The Vietnamese don’t really have the habit of drinking while they eat. They usually drink before or after a meal. Arguably, many Vietnamese dishes are soup based or come with a side soup making it easier to skip the drinks while eating. However, if you find yourself thirsty at a restaurant, the most common drink you will find is called Tra Da. 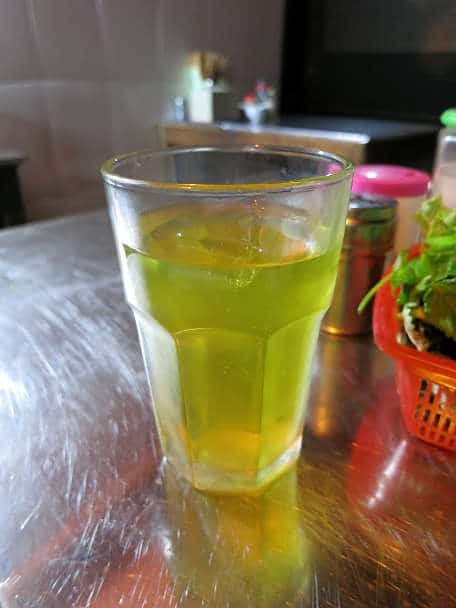 Tra Da is a very mild, yellow-colored iced tea and that doesn’t have much taste. It is available in a big pitcher on every table and is a replacement for tap water. As we wrote about in the article drinking water safely in Southeast Asia use caution when using the cups and make sure they are clean. Make a habit to use the straws available when using the cups on the table. Beer is widely popular in Vietnam and very affordable. The price of a beer can be as low as 12,000 VND or $0.50 USD. The brands of beer you will find vary by region. 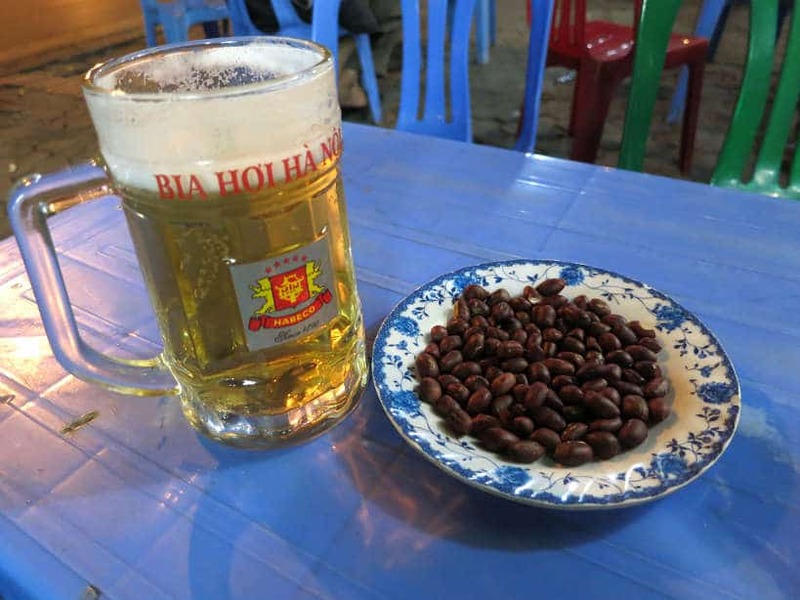 You will find “Bia Hanoi” in the north, and a variety of “Beer Saigon” in the south. 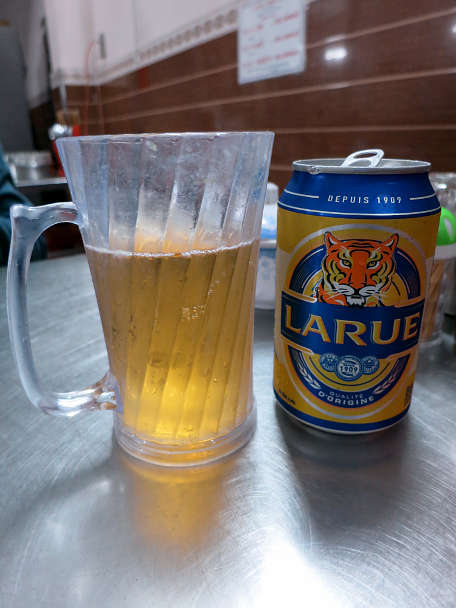 In the central region, “Beer La Rue” is the most common beer. One experience not to miss while in Vietnam is to pay a visit to the Bia Hoi “restaurants”. Here you can enjoy freshly made draft beer served in cold glasses with roasted peanuts for a very low price (less than $1USD). The beer itself is really light in alcohol and it is most enjoyed for its coolness. But more importantly, you will connect and “fit in” with the local as you see Vietnamese workers getting together after work to enjoy a glass (or more) of beers. Vietnam is the world’s second largest producer of coffee and the local brew is usually served with sweetened condensed milk and referred to as Caphe. 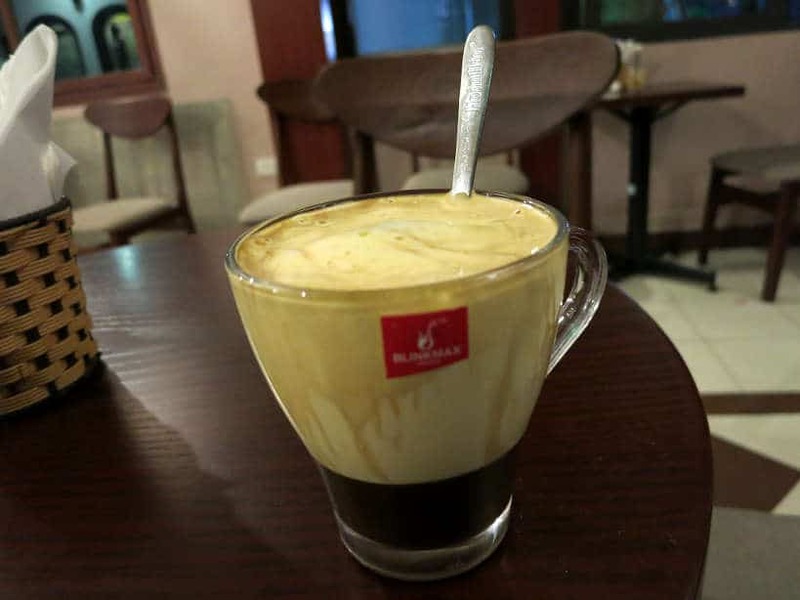 You will find different kinds of coffee that are served both hot and iced ranging from very strong, black or with condensed milk (called ca phe sua) in the South. The most famous coffee in the north of Vietnam is Egg Coffee (ca phe trung). This is a dark coffee topped with egg yolk whipped with condensed milk into an airy froth. 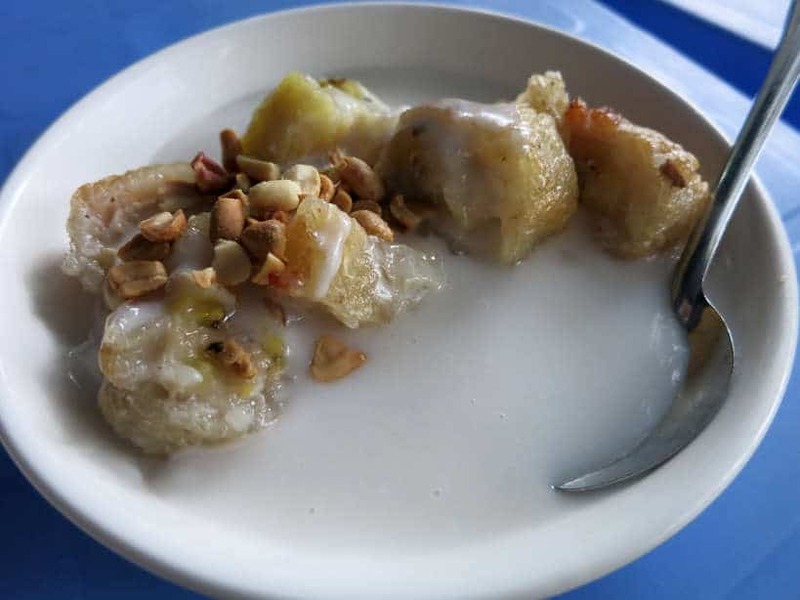 Ca phe trung is to be enjoyed as a dessert. It is quite rich and tastes similar to tiramisu. One of the best Hanoi food you want to experience! While in Vietnam, be sure to explore the rich coffee culture. The Vietnamese take a lot of pride in the preparation and presentation of their food. As noted earlier, many of the dishes are eaten with fresh herbs and accompanied with sauces. Often times, there is an order to the way the meals are eaten. The herbs are rolled together in a particular manner, with particular sauces that go with this type of food and not that one. 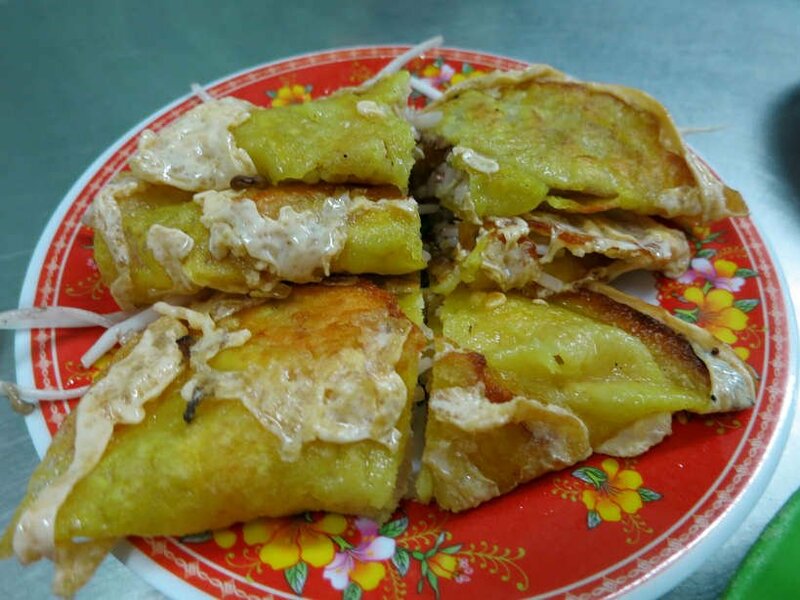 Da Nang in central Vietnam is one of the best places to eat the traditional local Vietnamese pancake, called Bánh Xèo. The first time we ordered this speciality, the server brought over rice paper, an overflowing bowl of fresh herbs, a thick sauce in a tiny dish, and sizzling pancakes cut up into slices. 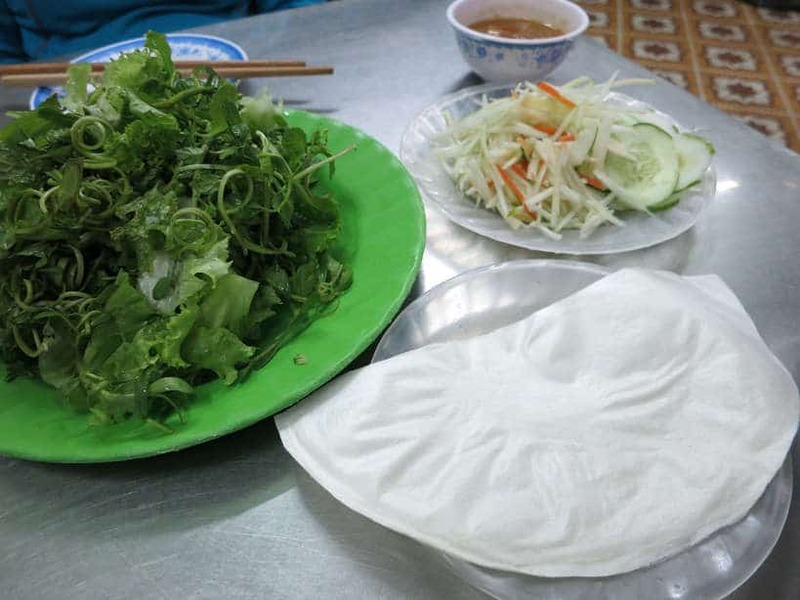 Rice paper, herbs, salad and dipping sauce for bánh xèo. Everything arrived at the same time and we looked at each other not quite sure how to begin. Usually, we take our cue on how to eat unusual dishes from the diners sitting on tables close by. Unfortunately, this time we were the only ones eating. A little unsure, Rosemary gingerly picked up a piece of rice paper and began stuffing everything in it. The cook from across the restaurant saw the chaos we were creating and quickly came over to show us the proper way to eat bánh xèo. As we continued to discover other local specialties around the country, the cook or server would always come over to show us the best way to eat the dishes. Well intentioned, their main focus was to make sure you combine the right flavors together for a delicious experience. When ordering the local specialties in Vietnam, don’t be afraid to ask the best way to enjoy the dishes. Be open when the staff comes to your table to help you enjoy the full flavors and textures of each meal. Don’t be surprised when you see trash on the floor in local Vietnamese restaurants. 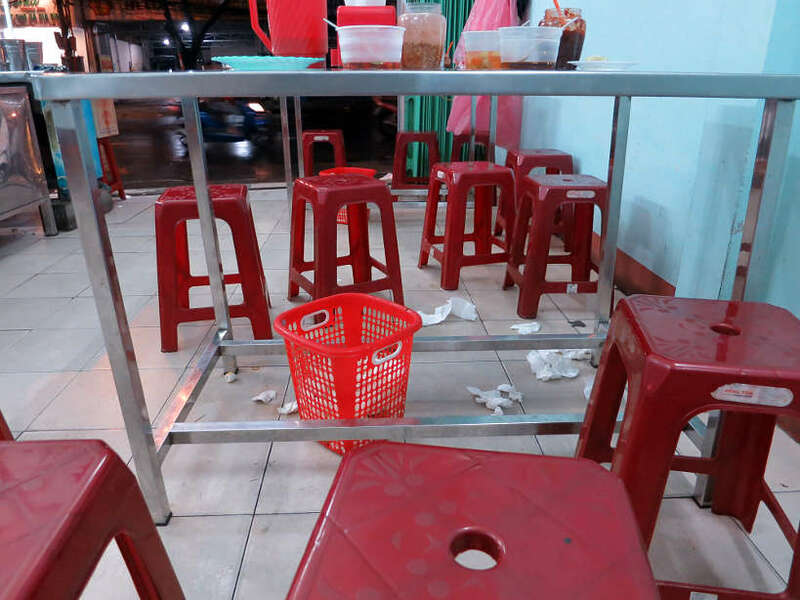 The garbage on the floor is not necessarily an indication of a dirty restaurant, but behavior that is customary at local eateries. You will see little blue or red plastic garbage bins underneath each table for throwing garbage including inedible ends of fresh herbs. What is striking is that the garbage does not always make it into the plastic bin. You will see white napkins littering the floor. One thing to mention is that in Vietnam, the napkins are not the traditional napkins you might expect. They are actually pieces of paper that have been cut up into square non-absorbent napkins. There is often only one plastic bin located at one end of the table, and it is meant to be shared by everyone sitting on a long table. Rather than ask people sharing the table to pass the bin around, locals would simply drop the food trash on the floor until someone comes along to clean it up later. When seated low to the ground, this can make for a pretty disagreeable eating environment. All things considered, learn to ignore the trash on the ground and focus your attention on the delicious food in Vietnam. 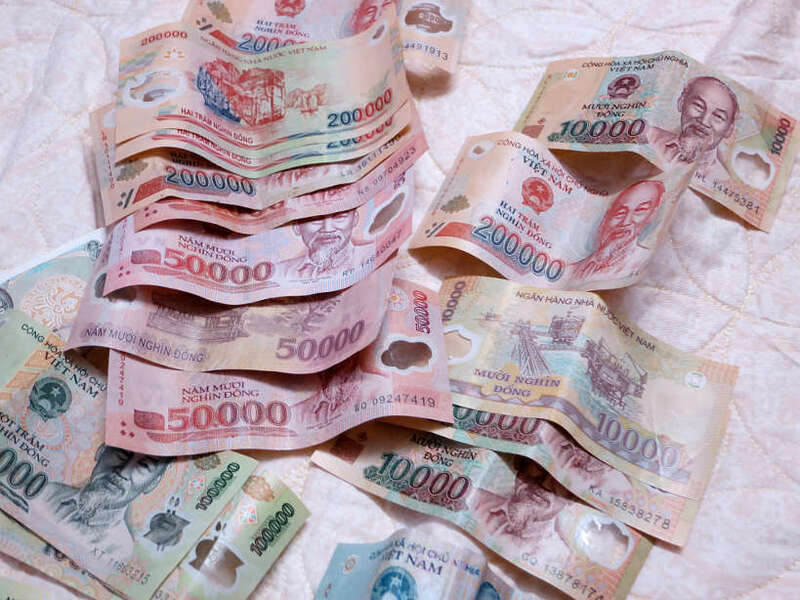 The Vietnamese currency is called the Vietnamese Dong (VND) and it is the second least valued currency in the world. The typical meal at a family restaurant is between $1.10 and $2.50 per person, which means you will end up carrying a lot of Dongs for just one meal. At the time of writing, $1 USD is equivalent to 22,800 VND. So, for a meal, you can expect to spend between 25,000 VND and 55,000 VND at most casual restaurants. Fortunately, the Dong comes in bills of 10,000 VND and 50,000 VND, which makes it easier to carry so much money around. Be prepared to spend about 100,000 VND per day on food. You will find that in about one week, you can easily spend over one million Vietnamese Dong on food and drinks alone which equates to only about $44 USD! The Vietnamese language compared to the neighboring countries uses the latin alphabet making it easier to read and memorize. Therefore, navigating the food is slightly more accessible or at least less intimidating. Although English isn’t widely spoken in Vietnam, we didn’t find it much of an issue in making ourselves understood. 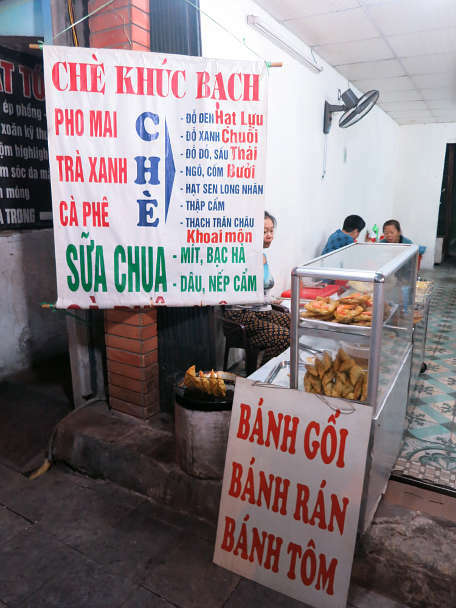 Here are a few culinary words in Vietnamese, to help you order your next dish. And of course, your vocabulary will expand as you taste and discover new dishes! Bánh refers to bread or cake and is used in many prepared foods in Vietnam. You will also find it used for many desserts and in the specialty Bánh Mi, the famous Vietnamese sandwich. Com refers to cook Rice while Ga refers to chicken. One of the common dishes you will find is Com Ga or chicken rice. Bún typically refers to noodle soup. Bò means beef which you will find in beef noodle soup like Bún Bò Huế a specialty from Central Vietnam. The ones you cannot miss and that are mentioned previously are: trà for tea; chè for desserts and bia for beer. While we don’t intend to provide an exhaustive list of Vietnamese words, these will get you started and familiar with the language. The pronunciation is different from what you read and it takes a bit of practice and listening to the locals to get it right. We strongly encourage you to give it a try! As you travel through Vietnam, be prepared to travel through time. With an immensely rich culture, Vietnam fascinates with its communist history, the devastation marked by the Vietnam War, and the renewed economic center in Ho Chi Minh, with marked French influence. The food in Vietnam is as fascinating and vibrant as its culture, with incredible flavors and tastes. Prepare yourself for a delightful culinary tour from the North to the South of Vietnam. Each region has unique local dishes and specialties that will compete for your attention and affection. Vietnam has definitely conquered our palate and taste buds. 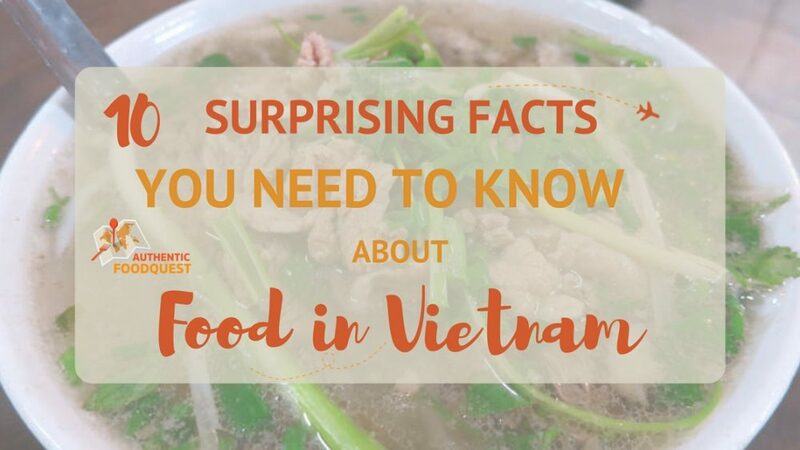 Read more about the local specialties that make the food in Vietnam so tantalizing. Have you had food in Vietnam before? In the comments below, share with us what surprised you the most about Vietnamese cuisine! I am so excited to go to Vietnam. It has been on my list of places to travel for quite some time now. I hope to go in the next year or so. I absolutely love Vietnamese food, and can’t wait to try out all their street foods. Thanks for the wonderful article. Looking at those low tables makes my back ache just thinking about it! Would it be inappropriate to just stand and eat? That’s a great question Scott. Funny, you should ask about standing. No one really did it and it’s practically difficult to eat a hot steaming bowl of soup for example standing up. You actually get used to the little stools…not the most comfortable, but the delicious flavors draw you in 🙂 Are you planning a trip to Vietnam soon? I don’t know how I found your blog but one thing that brought here is the highlight of this post. Vietnamese culinary. I love Vietnam food, and I wish one day I visit the country. Thank you for this amazing information. 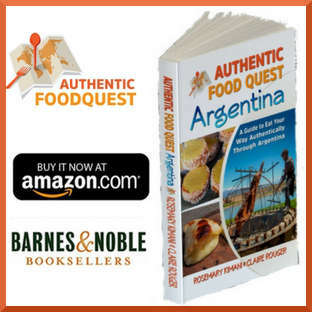 So happy that you found authentic food quest and this article. Vietnam is an incredible country. The people, the landscape and the food…truly magnificent. Glad you enjoyed the article and hope you make it to Vietnam soon. Thanks for stopping by!! This is one foodie destination that I am just DYING to go to. I think I will do nothing but eat Just go from one meal to the next. I love the fact that there are restaurants that serve only one dish and make it amazing. There are a few places I am discovering in Portland that do that as well. For foodies, Vietnam will not disappoint. The food and the local specialties are incredible. So glad to read that the concept of one meal at restaurants is growing in Portland. You can taste the difference in the quality of the food. Thanks so much, Andi. For Vietnam, you don’t have to be a foodie by any stretch of imagination. You only have to be open to the new tastes, flavors and ingredients. The food is certainly worth it’s reputation. Hope you can visit Vietnam soon. Thanks so much Tamara. Wish I had known these tips before spending a month in Vietnam! I never really put it together that Pho is a northern dish… but I sure enjoyed scarfing it! It’s never too late Lillie. Now that you have the tips, you can always plan another trip back to the Vietnam. Yes, you are right, pho is incredible and so different. Can completely how you were scarfing it down!! Amazing food. Cheers! I have always loved vietnamese food, but it seems like being there and tasting it is a real authentic experience. MAybe I should get out there this year and experiment with it. Sounds like a really interesting country. There is nothing like eating Vietnamese food in Vietnam. It is certainly worth the visit for the experience and the delicious flavors. If you can, do make sure to visit the country. You will absolutely love it!! Thanks Barbara!! Vietnam has been on my list of next possible destinations for awhile now. I have a habit of eating my way through a country, so would love to try authentic pho full of lots of fresh herbs! If Vietnam has been on your list, then absolutely make the point of going for it. The food is incredible. So many unique and diverse flavors that go way beyond pho. The good news is that Vietnamese food is on the healthy end of the spectrum…so you can indeed eat your way through the country. Do let us know if we can give you any tips about the food for your trip. Cheers! You are right Marlene, you have to take the local habits as part of the overall travel experience. We are looking forward to sharing more about the delicious Vietnamese food we discovered. Stay tuned…and stay hungry! The food of Vietnam is great! One of the best memories I have of Vietnam!! Great post! 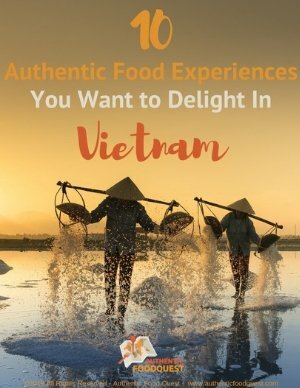 So glad you enjoyed the article Jacomijn…the food in Vietnam is indeed exceptional!! Mmmmm, I could live off that soup and beer! Looks delicious! Great photography, by the way! I always struggle with “food shots” and you do a nice job! Thank you so much, Rachel for your comments about the food photography. It is a work-in-progress and we are tweaking things all the time. Looks like it is paying off 🙂 Soup, beer and other local delights. You will find so much to enjoy in Vietnam! This was so interesting to read. I’ve had Vietnamese cuisine before, but I can only imagine having the authentic fare in Vietnam. That chè looked amazing. I’ve tried it a few different ways and I loved it with mango. That’s awesome Donnica, that you know che. It is truly unique and filled with so many ingredients. We did not see it with mango in Vietnam, but with we did see it offered with local fruits like dragon fruit. It is indeed worth the trip to Vietnam for the food. Thanks for stopping by. I never know where you two are showing up next! 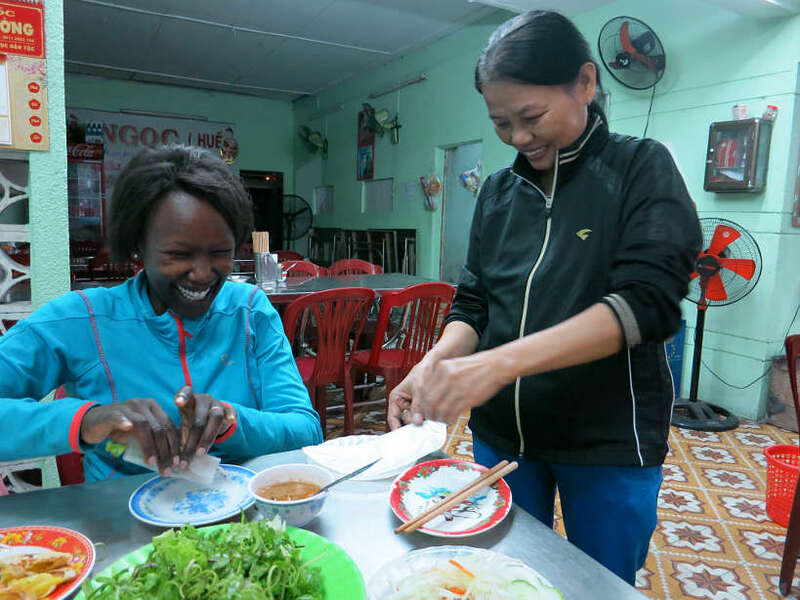 I love this post, as you sure show what dining is like in Vietnam. Now tell me, can you sit in a regular chair. I’m thinking my back would be sore after sitting on those little chairs. Great tip on that it’s common to see garbage tossed on the floor. So… did you purchase the hanging meat while checking out? Interesting on how herbs are used, as I’m thinking that really adds flavor to all the fish, which looks very popular. That’s awesome to read Claudia. So glad you really enjoyed the article. Absolutely, for anyone interested in food, Vietnam is a “must-visit” destination. We’ll be writing more about the food in the coming weeks. That should help you get prepared for your upcoming trip 🙂 Lot’s to enjoy and discover bia, caphe, pho is only the beginning…. :) Thanks so much!! Thanks Meg, how is it different in Australia? That’s one place we haven’t been to yet on our quest. Indeed, the best places for delicious food is in on the sidewalks. We did visit the restaurant President Obama and Anthony Bourdain visited, and while it was not on the streets, it was very casual. Reason being…it has the best pho in Hanoi 🙂 Hope you can get to Vietnam soon. You will absolutely love it! That’s awesome to read Tania, that this moved Vietnam up a couple of notches on your list. Out of curiosity, is there any particular dish you can’t wait to try? Thanks for stopping by. Vietnam wasn’t immediately on my bucket list but after I read this post I think it changed a bit :). The culture itself is so different and I think it’s worth learning from it! This is such a great post, really interesting. Did you find that there were many veggie options in Vietnam? Thanks so much Millie. So glad you enjoyed reading. Yes, indeed there are vegetarian options. To be honest, we did not seek out local vegetarian specialties, but with all the fresh veggies available, you will not go hungry as a vegetarian in Vietnam. Thanks for stopping by. What a super informative post! I think I would have to take a food tour, as I’m not super adventurous when it comes to food. Also not a soup fan, but dessert soup? Sign me up! Taking a food tour Leigh is not a bad idea. You do need to keep an open mind and a tour will offer that peace of mind. There are a variety of soups beyond pho that are quite delicious. I bet you could find something you like:) Yes, the dessert soups…plentiful and all kinds to choose from. So glad you enjoyed reading the article!! Interesting, I did not know about the 3 different regions for food. We eat a ton of Vietnamese food like bun and pho, plus I could live off of the coffee (yum). Good tips when I finally make it over there. That’s awesome to read Jen, that you have awesome Vietnamese food near where you live. You really do taste the regional differences in the food as you travel throughout the country. I do hope you make it over soon. You will be blown away by all the food options. Thanks for stopping by! 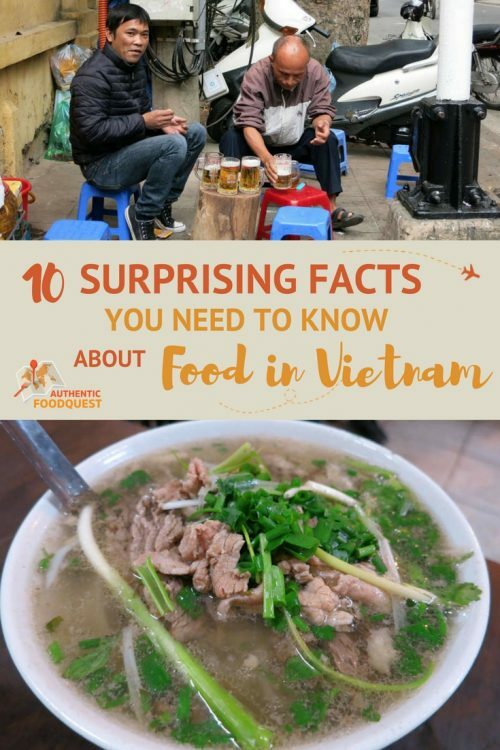 Great summary of Vietnamese food, beverages and eating culture! Just to say, I still have at home some coffee my friend brought me from Vietnam. So tasty! So glad you enjoyed reading the article. We’ll be going deeper into the food over the next coming weeks. Tasty food and very interesting coffee or caphe!!! Cheers. I was in Thailand and Cambodia over Christmas, but didn’t have time to make it to Vietnam. That will have to be a whole other trip. The food looks so delicious, my mouth is watering just reading your post! The food all looks so good and nice to hear it is so cheap. The trash on the floor does bother me though, not sure I could get used to that. Also, not sure about the iced tea. I think I would probably go with bottled water. Wow. This post makes me want to grab a snack because that desert soup looksso good. And that ice tea looks so funny with it’s neon color. Also love that most vendors only specialize in one dish. Good to know!!! 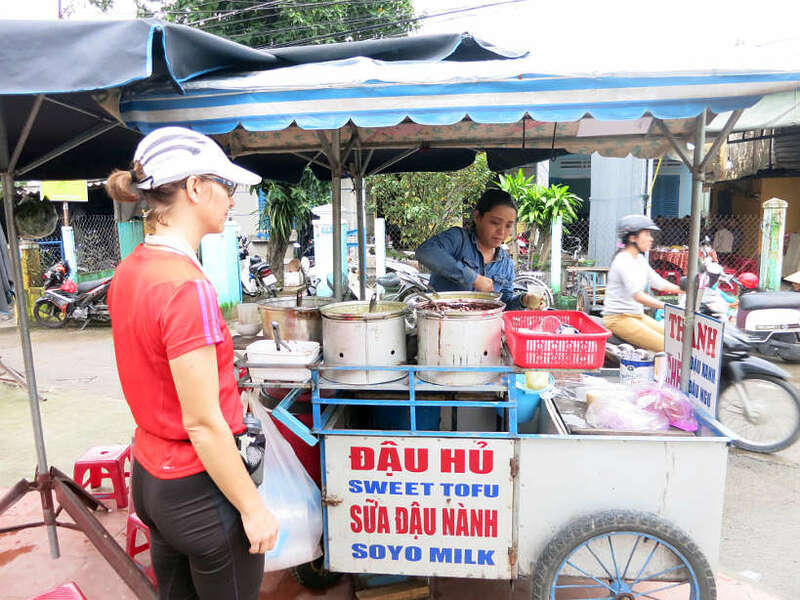 Glad this article is making you hungry…that’s what the food in Vietnam does 🙂 Having vendors specialize really makes for tasty dishes. Hope you can visit Vietnam soon and enjoy all the dessert soups for yourself! Thanks Kelly for stopping by. How interesting! It’s fun to learn more about the cuisine of different countries–I definitely learned things I never knew before! I live not too far away from Vietnam–down south here in Malaysia, but I haven’t had many opportunities to try Vietnamese food! So glad you enjoyed the article Rachel. We are currently in Malaysia and have actually been surprised by the number of Vietnamese restaurants we’ve seen. However, since you are relatively close to Vietnam, a trip to the country for the food is certainly warranted. Thanks for stopping by!! Thank you Alexandra and so glad you enjoyed reading the post. Yes, dessert soup is unique and quite delicious 🙂 Thanks for stopping by!! You’ve actually made me want to visit Vietnam one day after reading this article. Everything looked and sounded so tasty. It looked like a wonderful experience. 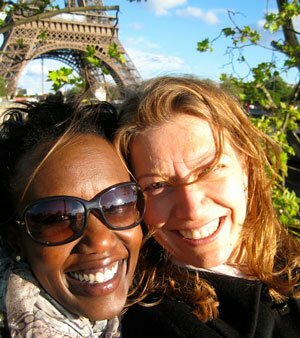 Also, I’m always fascinated in learning about cultural differences from around the world. We do things so differently here in the U.S.
That’s awesome to hear Tiffany that you are inspired to visit Vietnam. It is indeed a cultural difference as compared to the U.S. The food is also outstanding and something to be savored. So glad you enjoyed the article!! Cheers! I’m a huge fan of Vietnamese food! This list is so comprehensive and there are items on here I haven’t had the opportunity to try. I’ve never heard of chè chuối but I will make it a point to find it when we get to Vietnam! 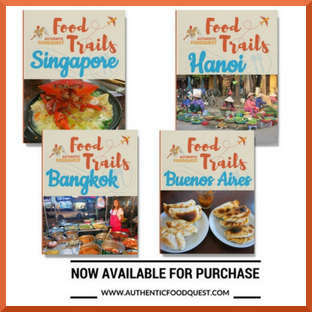 So glad you enjoyed the article, Tina.The goal is to showcase the local specialties so that travelers can know about the unique food and try them on their travels. 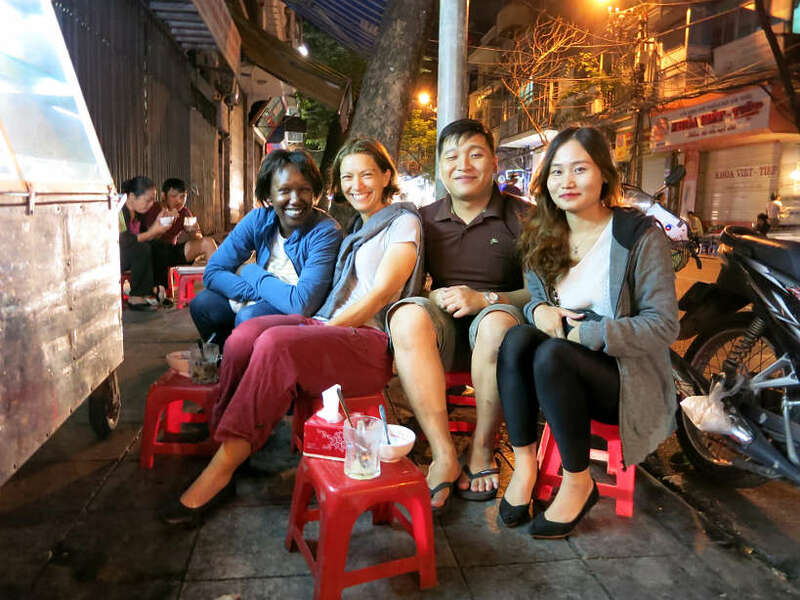 So glad to have inspired you to try chè chuối on your next trip. Do let us know what you think about it!! Cheers. I just spent a few weeks in Vietnam, I love your post! You really hit the nail on the head with everything. I never did find egg coffee in Saigon though, kind of disappointed about that. Awesome to read Emily that this article captured your experience as well. You are right, we had a hard time finding egg coffee in Saigon as well, but it does exist. Perhaps time for another trip? 🙂 Thanks for stopping by. We loved the food in Vietnam as well. The pho soup is outstanding. We can’t wait to go back either:) Thanks, Dustin.